MOORHEAD, MN – I’ve covered quite a bit a ground in the past several weeks, with much more to go before I return home. Today I’ll arrive in the town of Ramsey, near Minneapolis, where I’ll spend time with the company that makes the water transformation product we have dubbed, the Rainmaker. A couple of days ago I spent an amazing morning in Helena, MT, with water wizard, Dan Nelson, whose “engineered” water, which he calls, “Wayback,” (something to do with time travel — “the Wayback Machine” — and the Rocky the Flying Squirrel TV Show), is virtually 100% efficient, compared to most waters that are over 90% inefficient. He explained how he ignored the electron, and focused his attention on “pumping” the hydrogen proton, to get this very special water, a half-liter bottle of which will prepare many gallons of highly therapeutic water. ANY water that gets into the cells. The most water that gets into cells in the least amount, would be the most efficient. The effect of Dan’s engineering appears to show up on the bond angles that define the relationship between the Oxygen and Hydrogen atoms. I didn’t ask him this, but perhaps he straightens the molecule out, putting the Hydrogen on the other side of the Oxygen, as in H-O-H, or maybe he just extends them further than most. His insights are profound, and we could have talked much longer than the 75 minutes that we did on camera. I’ve known of Dan for several years. However, reading a 2009 white paper that he wrote, Stable High Spin-State Water, several months ago, gave me a deeper appreciation into the potential for wonderful change that water represents. I’m reviewing the video of our conversation, along with more of Judy Beebe, whose announcement that the Hydrogen atom is the Zero Point and the God connection, warrants sincere reflection and consideration. It would mean that God is present, not only “in” you and me, but as you and me. Personally, I’ve accepted that it is so. This doesn’t mean that people are “good” or “evil.” It means that the entire spectra of potential exists within every human being. Each is free to choose who and what to express of that potential. Surely, Hydrogen can be powerfully explosive. However, most people are unaware that Hydrogen is active in all creation, and can be interacted with in very positive and highly beneficial ways, when water is involved. Judy shared some insights that speak directly to this point. Judy and Dan’s various positions on water are actually quite synergistic. In fact, I told him about her discovery, which intrigued him. No “inventor’s rivalry” whatsoever. In fact, he wanted to meet her, and I introduced the two. Before I get off on another tangent, I have video interviews with two other Wizards, or Voices of Water. I interviewed A. 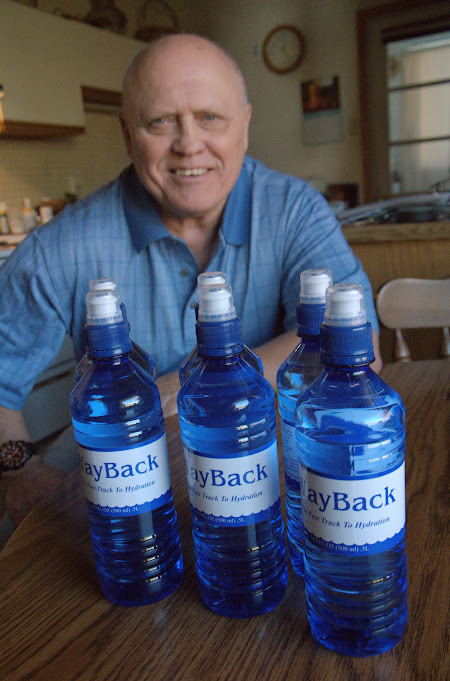 True Ott, of Mother Earth Minerals (www.meminerals.com), also prepares and markets a water product, called, Aqua Vivos, and Bengt Robbert, who doesn’t have a web site. I met Bengt, a modern day alchemist, at the end of my Summer Road Trip, as we stopped in Port Hueneme, California to see my friend and microbiologist, Joseph Johnson, of ABC Organics (www.abcorganics.com). My plan was to interview Joseph, who has designed several tests that demonstrate the increase in measurable nutrient solubility in water, measured in parts per million (PPM) when it is passed through one of the Rainmaker device. Although he had done the tests, which confirmed the findings, Joseph hadn’t finished building his lab, which would look better on video. The unexpected bonus for me was to meet Bengt, who I “knew” only by his posts on Barry Carter’s White Gold list. Bengt supplies an ORME (Orbitally Rearranged, Monoatomic Element) product referred to as “The Spice,” based loosely (I guess) on the material that was the basis of the storyline in the Dune moves. Until several weeks ago, I hadn’t watched any of the movies, so this conversation was far more general, which I titled, The Alchemy of LIfe. This is the first of two interviews that we did. The second one being on water. Bengt is an independent water scientist too. I also might add here that as a result of producing this video, Bengt is now engaged to be married to a beautiful woman in England, who saw it, and fell in love with the man. It was mutual. As I prepare to pack up my stuff and continue my journey, I’m also working out when and how to bring these perspectives on water to you. As you listen to these people, who did not know each other before I came along (I introduced Bengt and True Ott as well), consider the implications of what they’re saying about water with the new context of Hydrogen being the presence of, and doorway to God. Okay, okay! I’ll get the videos done first. I saw this video last night and I was thinking the same thing about you as the woman in England was thinking about Bengt. Hmm…he’s into some of what I am into and hmm…therefore he’s intelligent and must be aware of ancient african knowledge because it lives in him and hmm…i’m in the same age range…wonder if he’s married…hmm…. Of course, however, I have found some things online that are not all positive comments about the spice..of Life.